Offer ends midnight April 22nd! Hurry! Offer Expires In Just A Few Days! Woodmaster Drum Sanders are Made-In-America! Woodmaster Drum Sanders are made in the USA and are “built like tanks” - solid as America - for years of smooth, stable performance. So smooth, in fact, you can stand a nickel on edge while the machine is sanding! We don’t cut corners or make design compromises to keep prices low. We do keep our machines simple and unfussy. Customers have compared them to old Farmall Tractors and ’57 Chevys: simple, rugged American machines that just don’t quit. Yes, you can pay less for an overseas sander, but with a Woodmaster, you’ll get far more in performance, ease-of-use and durability...and save thousands of dollars in the long run. captures dust before it can rotate and load sand paper. 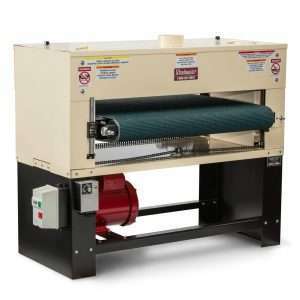 Woodmaster dust chutes are not hung from inside the hood as an engineering afterthought...they’re fully-integrated into the body of the machine, the same as you’d find on a wide-belt sander. Woodmaster’s infinitely variable feed system lets you add a conveyor reversing switch -- an exclusive advantage not possible with most Asian machines we know of. Eliminates hiking between infeed and outfeed. Simply flip the switch and the conveyor belt reverses. Your workpiece comes back to you as it gets another sanding pass. 3-M Corp., leading sandpaper manufacturer, conducted studies and concluded that, for 6” dia. 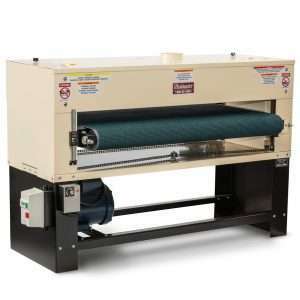 drums, 750 rpm is the optimum speed for sanding efficiency and longer paper life. Hence, all our drums turn at this recommended speed. This translates to a drum surface speed of 1,150 fpm. Taiwan sanders turn at twice this speed, which can prematurely degrade, load the sand paper, cause glazing and, worst of all, burn the work piece. 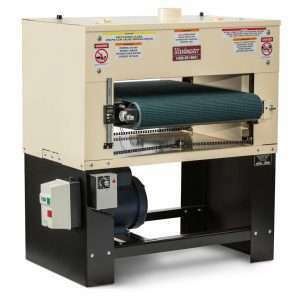 Woodmaster belts use trapezoid-shaped infeed conveyor rollers and are engineered to be self-aligning. Our large, 4” dia. rollers are nearly twice the diameter of Taiwan rollers. This means you get twice as much traction – perfect for aggressive sanding and large, heavy work pieces. 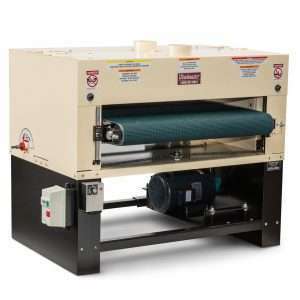 Only Woodmaster offers dual drum sanders that let you operate one drum independently of the other. It's all done with the simple turn of a lever. No other sanders offer this critical advantage! You save valuable fine grit paper by raising the outfeed drum when making multiple passes with heavy grit paper. An easy task with Woodmaster...impossible with other sanders. AMERICAN workers hand-assemble every Woodmaster. 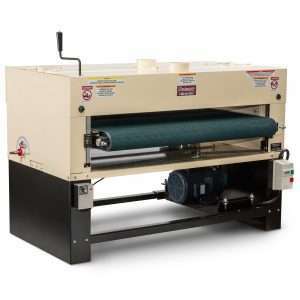 Your drum sander is built the way machinery used to be built – heavy, solid, true, simple, overbuilt to last. We build ‘em right here in Kansas City, USA. When you call, you’ll talk with a real person right in KC – folks who earn a wage running and/or assembling our machines. That’s why we put a 5-Year Limited Warranty on every Woodmaster.